Objects and spaces can tell a story as well as any person can. In fact, like in Daphne Du Maurier’s “Rebecca”, interactions in the surroundings can illustrate a character more thoroughly than the presence of the character itself. Human expression is no doubt very impactful; the reason why portraits can be so mesmerizing. But I feel inspired by the challenge of capturing a tale in letters, objects, textures and colors. I want to capture that nuance of a feeling that makes us attribute a personality to an empty chair, or memories to a landscape. I want to capture that stream of consciousness through art, that authors like Katherine Mansfield and Virigina Woolf did through words. I want to create a “slice of life” short story, without a defined beginning or end, but a profound view into a single moment in time. When I began to devote my time seriously to my artwork, I started by exploring simple landscapes, doing short courses on arabic calligraphy, and dabbling in abstracts. Beyond the short courses, I relied entirely on my primitive instincts to guide my artwork; teaching myself through practice. Alongside, I felt the urge to use art to reach out to the community at large and so began to organize a series of community art projects. Some of them involved underprivileged students (with The Garage School) or special children (with Special Olympics Pakistan), others involved women striving to better their situation (with The Orange Tree Foundation). All of them invited the public at large to join in, listen and contribute to the stories of these women and children as they fought insurmountable odds to fuel their aspirations. So essentially, my artwork was developing in two distinct tracks: the personal art that I created to continue understanding myself as an artist, and the community projects I was developing to harness art to influence people. Going forward, I want to amalgamate the two. Earlier this year I took a screen printing class at a local university in Jeddah, and it generated a lot of new ideas in my head, especially how a fusion of digital and traditional media could lend interesting results. I began to explore stencilling, simple wood cuts, lino carvings and photo transfers. It added yet another interest to my ever growing repertoire of mediums. But it also made me realize that I needed to consolidate my artistic style in order to understand where I was truly headed. This did not mean that I would stop experimenting with pastels or color pencils or porcelain (as those are the creative outlets that keep me continually inspired and inventive), but it did mean that I needed to step back and focus on a few particular mediums that would allow me to explore my own style more deeply as opposed to pervasively. So as this masters program begins, I have begun to work on my most recent series, titled “Heedlessness” where I combine landscapes, textures and the calligraphy of Arabic poetry to encapsulate a thought. I use a variety of methods and materials, such as photo transfers, texture pastes, inks, stencils, bamboo pens to complete each painting. The first step, therefore, is to continue with an exploration of this style that incorporates my most used elements i.e. landscapes, architecture, islamic geometry, calligraphy, in the mediums that inspire me the most i.e. acrylics, inks, textures, photo transfers, screen printing, to isolate my specific style. The final goal will be to develop a community art project that will be a narrative on the state of the city of Karachi. The project will be titled “Reclaiming Karachi” and the basic idea will be to use only recycled materials to create paintings that express something beautiful about this city, which has so much potential and yet has been allowed to turn into a dump. For example, as a participant artist I will be leveraging the style I develop earlier and incorporating overlooked landscapes like the Arabian sea and iconic colonial architecture crumbling away in certain districts of Karachi through photographs, along with calligraphy of “Shairi” (urdu poetry) to create art through recycled waste. This will be my commentary on the city of Karachi and other artists, with different pursuits, such as perhaps portraits, will be invited to do the same. As organizer of the project, I hope to connect with various local brands to document the artist’s process and give the project visibility. The culmination of the project will be an exhibition of some of the art produced by the artists, and any funds raised will be used to clean up the city and possibly brighten the currently very very dim future of what was once called, The City of Lights. Can’t seem to stop staring at the vibrant beauties you’ve come up with. I hope you achieve the slice of life goal and every other goals you set inshaAllah. I am horrible horrible when it comes to drawing. I give myself a pat on the back if i can draw a perfect apple. 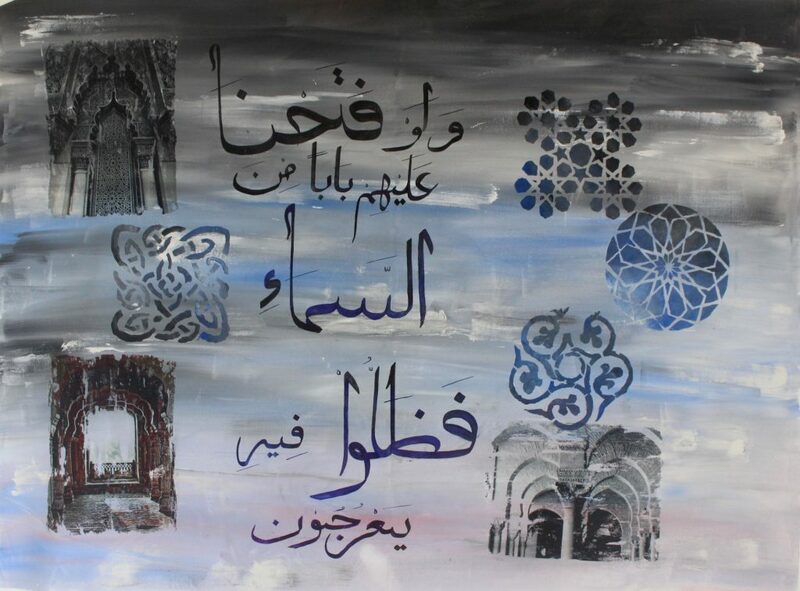 But ur artwork amazes me mashallah!! Masha Allah and subhan Allah r the first words that come out when I look at your artwork.. not commenting just for the sake of comment but to truly appreciate your god gifted talent !! Seriously your artwork is marvelous. It shows how you have followed your passion and emerged as an expert. I have followed few tutorials of yours but as I am not good at art so haven’t dared to try any yet.. wish you best of luck to pursue your passion of art..